A Century of Contributions to Gifted Education traces the conceptual history of the field of gifted education. Bookended by Sir Francis Galton’s Hereditary Genius published in 1869, and Sidney Marland’s report to the United States Congress in 1972, each chapter represents the life and work of a key figure in the development of the field. 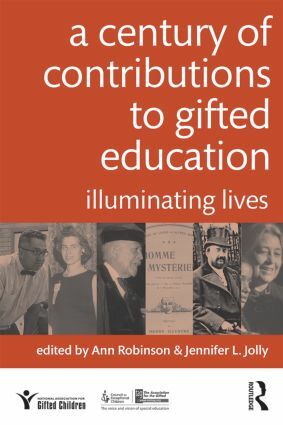 While the historical record of gifted education has previously been limited, A Century of Contributions to Gifted Education explores the lives of individuals who made fundamental contributions in the areas of eminence, intelligence, creativity, advocacy, policy, and curriculum. Drawing heavily on archival research and primary source documentation, expert contributors highlight the major philosophical, theoretical, and pedagogical developments in gifted education over the course of a century, providing both lively biography and scholarly analysis.